The Vultee V-1 was initially built to serve as a single-engine passenger aircraft, a type that was gaining popularity with airlines. A low wing, all metal, cantilever aircraft with retractable main gear, this 1932 design was well ahead of its time. Designed to carry a pilot and eight passengers, it was one of the last solely designed as a passenger airliner. The V-1A was a slightly larger and more powerful version of the V-1 which had two pilots. It entered service with American Airlines in 1934 along with 20 of its brethren. A V-1A was fitted out for a non-stop Trans-Atlantic flight and had all the empty spaces filled with ping pong balls in an effort to keep it afloat in case it crashed at sea! With single engined passenger liners being banned from paying service, the V-1As were sold off, at least 7 of them making it to Spain where they were used as transports, recce planes and general hacks. These were modified in-country with a defensive upper gun, which id nothing for its looks! A very nicely molded kit that has very little in the way of non-styrene parts. Molding is typical of MPM kits being crisply done and well up to modern standards. The cockpit is basic with the control wheels done is resin. Six seats are provided for the cabin (one row is empty for the gunner) and the cabin windows are in clear, injected plastic. The 'canopy' was obviously too much for MPM's molders as that is supplied as vac plastic. The cockpit roof is provided as injected plastic in case you wish to use it. The only other resin bits are the exhaust, DF loop and some small bits. The prop is a single piece (yay!) and the engine well molded, though generic and it has quite a bit of flash. There are no landing gear struts, the wheels being attached to the inside of the gear doors, but apparently this is prototypical. There are also small inner doors that are normally attached to the lower main gear doors, but those are not indicated as being used. They are shown on the painting and markings guide The upper gun position and cover are provided as is a plug for the top in case you feel like doing a straight passenger plane (which is bound to come in another boxing). Instructions are very well done giving all sorts of helpful guides and color info. Colors are coded to Humbrol paints but generic names are also provided. Markings are for two planes, but the only real difference is paint. One is the box art plane in dark green with desert yellow splotches over medium blue with the other not having the yellow mottling. The tail colors are on a decal, but the red bands will have to be painted by the builder. 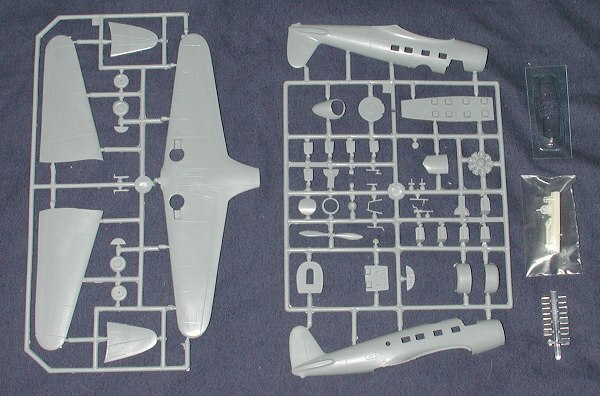 Decals are superbly printed as one comes to expect from MPM kits. 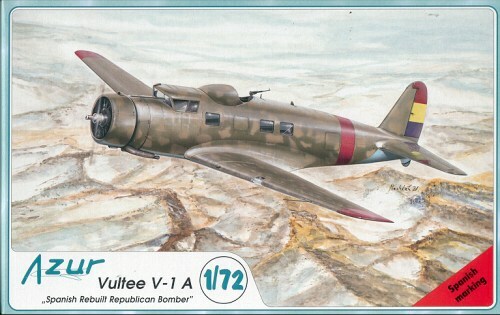 With all those people out there clamouring for 'between the wars' aircraft, they can now add the Vultee V-1A to their collection. It should not be a problem to build as it looks very well done. Kit courtesy of the insatiable appetite of my credit card!